On Sunday, Ganeshji left our home for this year. 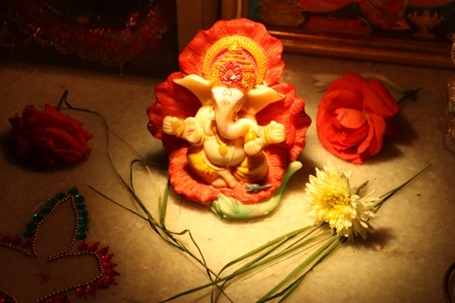 It was special this time as I made the Ganesh idol myself. The Think Green team in our apartment organized a 2-day workshop on idol making. They invited a person who is a graduate from a Japanese school in ceramic arts & pottery. I found the instructor very knowledgable and am glad I got to learn a few interesting techniques in clay modeling from him. Select a mold based on the size of idol you want. We used a 12-inch ‘plaster of paris’ mold which is actually in two parts – one for the front structure of the idol and the other for the back. Dust both the molds using any talcum powder (it was cinthol in our case). Massage thick, elongated chunks of clay. Press firmly over the mold. Ensure you do this quickly before the clay dries up. Remove any excess clay from the sides of the mold. Press the two molds together and shake the complete mold gently to loosen the idol. De-mold the idol carefully. Wipe the idol with a wet sponge to get an even texture. Now add the other features that were absent in the mold. For instance, we hand-molded the trunk, laddus and mouse. Use toothpicks, pen caps and other fine instruments to mark features on the face and create patterns on the idol. Allow it to dry, preferably not directly under hot sun. I was very happy with the way the idol turned out. I remember my friends making fun of my mouse. To be precise someone said it looked like a cross between a frog and a lizard 🙂 Thanks to our instructor for skillfully correcting it. On Ganesh Chaturthi I made puliyogre, steamed modaks and laddus. Puliyogre is one dish I always make on this festival. Although I regularly make it at least once a week all year long, it tastes best on Ganesh Chaturthi. I think the vibration of cooking for God has something to do with it. The laddus I made were the no-cook ones. I ground fried gram dal with dry fruits such as almonds, cashew nuts and cardamom seeds. I then added raisins (fried in ghee) and powdered sugar. Finally I bound them with some hot milk. 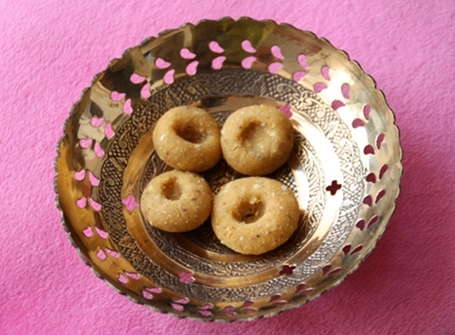 These laddus are easy to make and my kids love them too. Just call them “Chota Bheem laddus” and they will disappear. After the pooja in the morning we had a few rounds of visits to the neighbors. This went on till evening. Finally, we caught the late night show of the movie ‘Barfi!’ . I think this movie is one of its kind (in Bollywood at least). Very impressive to see how much they’ve managed to communicate with the lead actors having no dialogs at all. The person who has invested in this movie really believed in it. The movie is a runaway hit which goes on to prove that Indians still enjoy meaningful cinema. We don’t need skimpy skirts and weird thrusts for box-office hits. This movie will now open doors to other movies of the same genre. I’m glad it’s India’s official entry to the Oscars. Coming to a couple of other interesting things I received this week via mail. On Tuesday I got this courier sent to me my Dan Weissbrot, the relationship Director of What To Expect. The package contained their recent books they have launched as a part of the ‘What to expect’ series. The famous book that every pregnant woman has used. I remember my dad buying this for my sister more than a decade ago when she was expecting her first child. 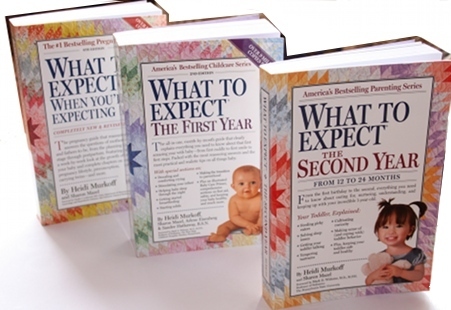 The title of the book was “What to expect when you are expecting”. A wonderful week-by-week guide on what a pregnant lady can expect. Now there are books available for the first few years of development as well. I remember the courier lady’s expression when she handed over the parcel to me. She was draped in a saree sporting a cap, looking really tired. She said “Madam, what is in this package? I have been carrying it all morning and its quiet heavy”. I told her that the package contained books, shipped all the way from New York. She smiled as she shared my joy for a moment. Thanks to the What to Expect team for sending these books to me. I found the books on the first two years of a child’s development as informative as the one on pregnancy. On Wednesday afternoon I received another courier. This time it was the Mother’s world magazine and I was once again delighted. 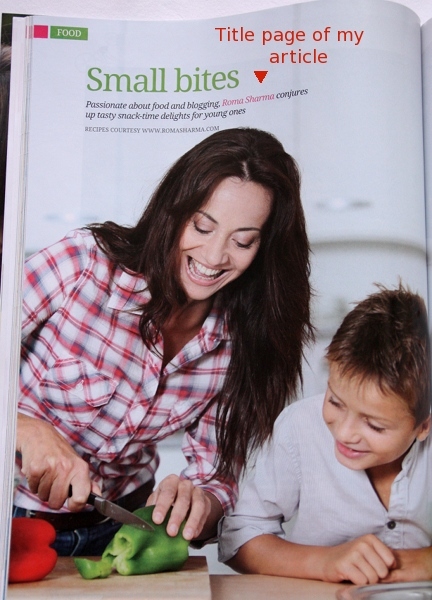 The September issue carries four of my recipes under a section called small-bites. I had put together recipes and images of Mint Melon cooler, vegetable nutri-pie, chocolate pudding and green moong chaat. These were the evening treats for kids which are nutritious as well as tasty. 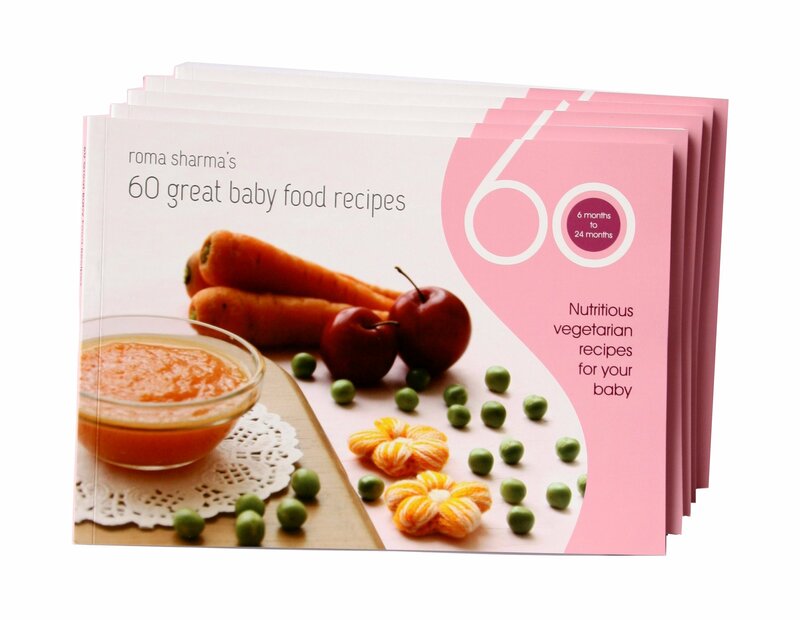 The article turned out well, designed beautifully with vibrant pictures of ingredients. Well, so much for the week that went by. 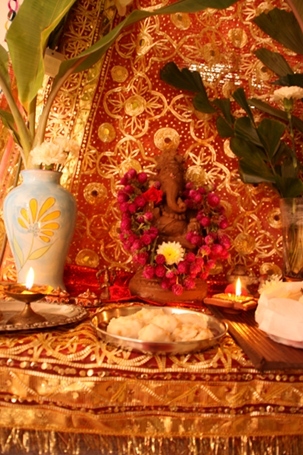 Ganesh Chathurti is the longest festival of the year for us. We actually worship the idol in our mantap for approx. 10 days. On Sunday, we used a tank provided by our apartment for Visarjan (immersion of idol in water). This time I am a bit more sad as I made the idol myself. We will miss you Ganeshji. We are sending you to water only to return quickly from the clay next year. Before I sign off, I just want to share one more picture with you. This is the pop-up card Raina and I made for her school teacher. 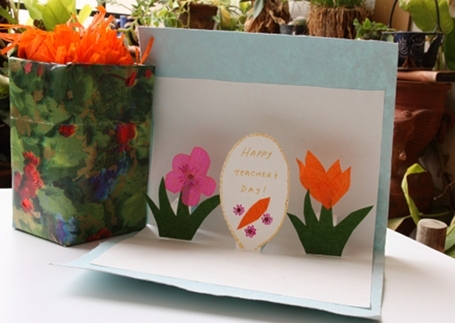 As the card indicates, its for teacher’s day. I learnt it from a simple video on you tube. You can try your hand at an interesting 3-D pop-up card if you find the time. Hi Shilpa, I got the mold from some the people who conducted the workshop. They are based in Indranagar, I dont have their contact. If you are in Bangalore, you can get it from a boutique which sells clay articles. 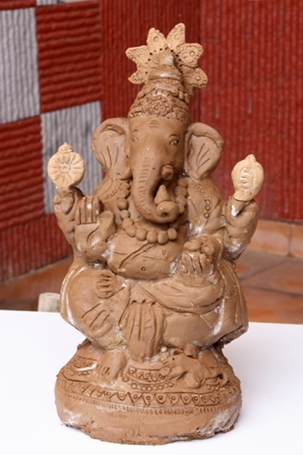 They will most probably have a plaster-of-paris mold they use during Ganesh festivals. The workshop guys said that the mold cost is approx 1.5k. Hi is the mold cost 1.5lac?